As they sing in the Rocky Horror Picture Show, "Don't dream it — be it." 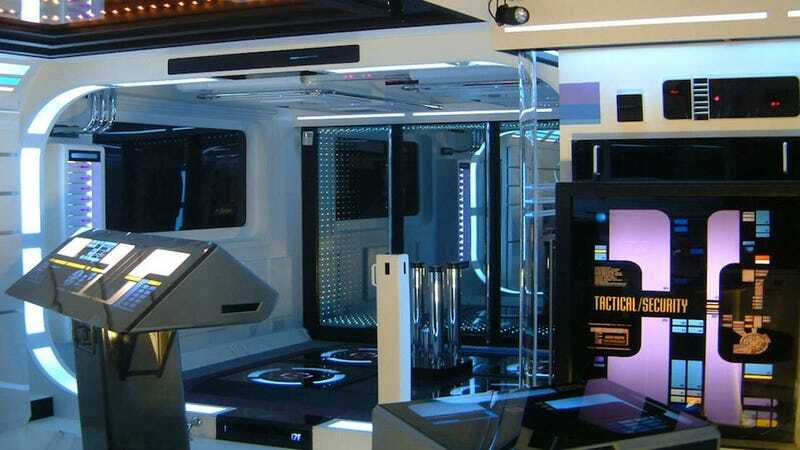 That's what these fans have done, by turing rooms and even whole apartments into the sets from their favorite science fiction shows and movies. In 1994, Alleyne began the work on his 500-square foot apartment and within 10 years he just converted it to a fantastic Federation vessel. In 2012 he was getting a divorce from wife who owns the flat, and wanted to sell it. The Tetris-like building has 140 prefabricated capsules which are each measure 7.5ft x 12 ft x 6.9ft. (2.3m x 3.8 m x 2.1 m). These can be connected and combined to create larger apartments. Every appliances and cabinets were built in to one side, and the aircraft-like shower to the other. It took a year to build. Six flat panel HDTVs, life-size, talking R2-D2 and C-3PO replicas, and a curved 107-inch display. Sounds good. The huge residence with 4 bedrooms, 6.5 bathrooms, a pool house, a volleyball court, a ballroom, a giant exercise room and a wine cellar is for sale. It's quite cheap, could be yours for only $5 million. After years of collecting sci-fi memorabilias, dr. Winn decided to built a big home theater with a 144-inch screen to place them.